This article is excerpted from the Venerable Khenpo Rinpoches’ teachings on Tsele Natsok Rangdrol’s Lamp of Mahamudra given during the Self-Development Dzogchen Retreat at Padma Samye Ling in 2008. “Search for your mind. Where is it coming from? Where is it now? Where is it going? When you use these three questions to try to pinpoint your mind, you’ll discover that there’s nothing substantial or solid to find. Our past thoughts are gone, our future thoughts have not yet arisen, and the present thought disappears the moment we look for it. These three investigations reveal that the past mind is empty, the present mind is empty, and the future mind is empty. When you don’t find anything, it’s time to relax. Now you’re not going to try to look for anything. Trying to find something just makes us tired; ultimately there’s nothing to find. When we begin to relax in this state, we’re going to apply three techniques: (1) don’t get distracted, (2) don’t meditate, and (3) don’t change anything. These are the master Tsele Natsok Rangdrol’s pith instructions on how to meditate. Simply relax in the mind’s own natural state without doing anything. Just relax. This is practical advice on how to stay with the nature of mind. In order to make this pith instruction more meaningful, first we have to recognize the nature of our mind. Once we behold our nature, applying these three reminders becomes very useful. The first instruction to not get distracted is very, very important. Once we behold the view, we have to try to maintain that with meditation. The biggest obstacle to maintaining the view is distraction. Therefore, be watchful of distraction and try to stay with what you’ve already recognized. Continually carry the view with mindfulness, but without being too forceful. Mindfulness itself can be a distraction if we apply it too much. Therefore, keep the strength of your mindfulness, but let the mind stay with the view without being distracted by any method. Many great Dzogchen teachings say to relax nakedly, relax freshly, relax in the natural state. Naked, fresh, and natural—these words have a lot of meaning. They are practical instructions we can use to remind ourselves and usher us back to what we’ve already recognized. The third instruction is “don’t change anything.” This means that during meditation, continually relax in the natural state and don’t try to change or construct anything. Don’t fabricate anything, and don’t add or subtract anything. Just let it flow continually as it is. Whether we’re practicing Shamatha or Vipashyana meditation, we should always remember these three qualities. (1) Don’t get distracted. (2) Don’t forcefully meditate. (3) And don’t construct or change anything. This is practical advice we can remind ourselves of throughout our meditation. Keep this instruction near you so that you can use it as you continue to progress in your practice. Once we’re relaxing our mind and abiding in the natural state, most of the time we cannot stay relaxed. Immediately, or after a few seconds, a thought will come up. Whenever a thought comes up, let it come and don’t follow after it. Instead of chasing the thought, look inward to that thought with your mind. The Dzogchen teachings often say to look directly at the face of arising thoughts. This means the thinker of the thought will look at the thought itself. Right at that moment, the looker and what is being looked at merge and become one. Liberating that thought is enough. Now you have come back to the natural state. Continually relax in that way. Otherwise, if we start chasing thoughts, trying to reject or accept them, or use different antidotes, we’re distracted, constructing and changing the nature, fabricating, and being forceful, which means that we’re at the edge of duality. We’re back within the boundary of duality mind and can get carried away by it. Therefore, the most important thing is to relax, and as a thought arises, immediately let it dissolve. This is exactly what Dzogchen and Mahamudra meditation should do. Otherwise it’s not Dzogchen or Mahamudra. The Great Brahmin Saraha said that most practitioners are deluding their meditation with effort. Really there is nothing to meditate on. And since there is nothing to meditate on, there is also nothing at all to be distracted by. Instead, by relaxing in the natural state, there is no distraction even for an instant. This is how meditation becomes perfect. All the teachings of the Buddha and every great master taught in a single voice that when we’re meditating, we have to relax uncontrived without any grasping or holding. When it comes to Vipashyana, Dzogchen, and Mahamudra meditation, every master agrees that we have to maintain the nature. While we’re relaxing in the state of unimpeded realization without any grasping or holding, and without any effort, the teachings always mention that there are some hindrances we have to watch out for. When we’re continually abiding in the natural state, many practitioners often think that we have to shut down our senses and go into a no-thought state, believing that is the ultimate meditation. If we’re holding onto that notion and not allowing or blocking the functional activity of our senses in order to stay in a state without any thinking, it becomes Shamatha concentration meditation—which isn’t bad, but it’s not Vipashyana. When we’re meditating, there are a few different stages we may go through. Sometimes we reach a certain stage that is very neutral and without thoughts, but at the same time, there’s no clarity. It’s a very vague state of mind. This is not the ultimate meditation. It’s just an experience and is actually leaning more toward Shamatha. Some practitioners have meditation experiences where they’re trying to stay focused on the present—no past and no future—which is good, but thinking about the present state too much is like dividing up and blocking out parts of the whole panorama of the nature. That is just another experience of partiality. 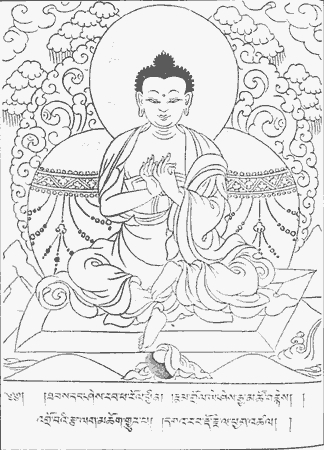 Some practitioners may think during meditation: “Oh, my nature of mind is the dharmakaya. My nature of mind is emptiness. My nature of mind is openness. All these perceptions are illusions or delusions.” Holding onto those thoughts all the time and trying to intentionally be in that state is contrived. It’s just an idea. We’re still standing in the ditch of conceptions. Then there are some people who think that anything at all is meditation. Whatever thought comes, whatever one is thinking, whatever is appearing, all of it is just fine, it’s all good, it’s all meditation. Thinking in this way leads to many unbalanced things and our meditation becomes completely mixed up and crazy. During meditation, some people might think that the movement of thought is always bad. They’re always trying to stop that movement, so there’s always a certain degree of hope and fear about trying to stop thoughts when they arise. This makes meditation so tight, and only creates more grasping and clinging. Generally speaking, all of those experiences are good, but if we continually hold onto those different attitudes it will blur our realization of the nature and won’t help us to progress or achieve realization. For that reason, Tsele Natsok Rangdrol said that whenever those experiences happen, the most important thing we can do is relax in the natural state without any hope or fear, without trying to do anything, without any effort, and without thinking “this is good” and “this is bad.” The moment you notice or recognize any of those errors, let them free themselves into their own natural state. Try to continually relax as you originally started. Whatever arises is a display of the nature, so just continue to relax, fresh and uncontrived. The Dzogchen teachings say that whenever we notice these experiences are happening, we should try to release them, liberating them into their own natural state. Together with our meditation, we should also highlight engaging in more meritorious activities such as Ngondro, bodhichitta activities, feeling joy and devotion, and doing purification practices. Those are all very, very important practices to accumulate merit. Do not ignore the relative truth goodness activities. Bring up a lot of heartfelt joy, love, and devotion, and do beneficial activities. In addition to the accumulation practices, both before and during our meditation, we should always bring up more bodhichitta and devotion. 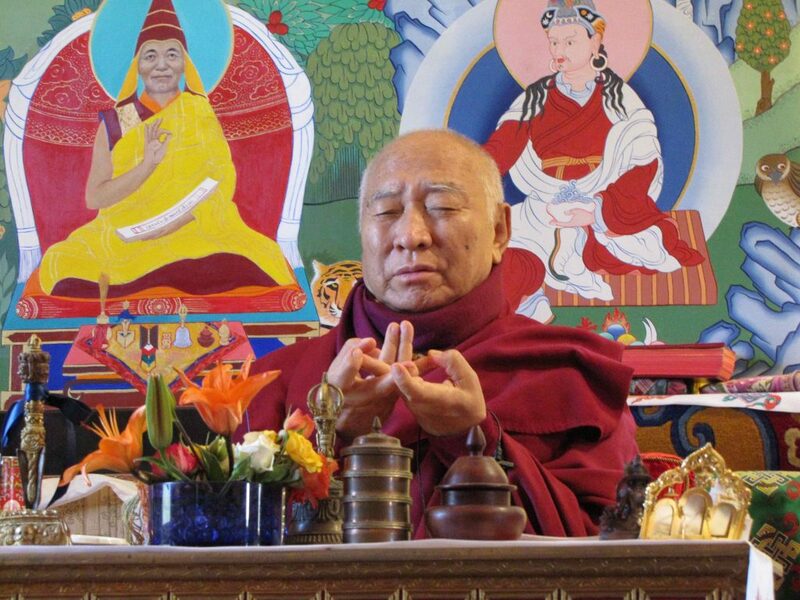 Devotion and bodhichitta are very, very important because when we have these two qualities, they bring the power of the lineage blessings to our heart and fertilize the soil of our mind so that our realization will grow very beautifully. Devotion and bodhichitta are very important at the beginning, during, and at the end of meditation because with them the moisture of the blessings will come. Along with this, we have to bring more confidence and joy to our meditation. When we’re meditating, who is meditating? It ‘s our mind. Every fabrication starts within the mind. The mind is the source of every fabrication, every exaggeration, and every deprecation. Everything starts from one’s own emptiness mind. We should have confidence in the view that we’ve already established and understand. With that confidence, during meditation we have to relax any kind of investigation, inquiry, doubt, and hesitation. This means that in the middle of our practice, bring everything back to the mind. The more you meditate and practice bodhichitta, the more you feel that others are as dear as yourself, and eventually their welfare becomes even more important than your own.